Although L.A. doesn't experience a "real" winter, in the East Coast sense, we do get a decent temperature drop around January and February. It's enough to make me swap my T-shirt for a sweater but not quite to the point that it necessitates layers upon layers, and for me, there's really one item that I've come to rely on for the in-between weather: a cropped sweater. My wardrobe hinges on the piece so much so that I've racked up a sizable collection of them, all of which I wear on repeat. Maybe a cropped sweater seems redundant. Isn't the point to keep you, well, warm? But it's L.A.'s in-between weather that makes these knits the perfect choice. That, and I'm a religious wearer of high-rise pants (the higher the rise the better the pants, I say), so I've come to favor a shorter hemline in my knit selection to avoid an awkward and bulky sweater tuck. I don't discriminate, either. 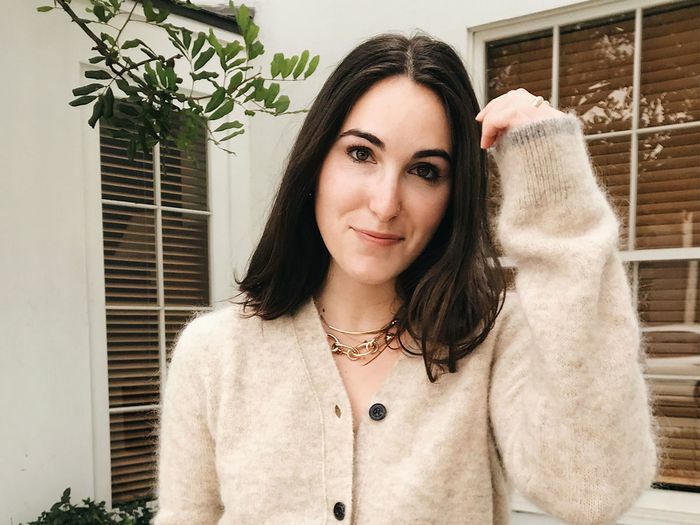 Turtlenecks, cardigans, and crewnecks are all equally loved in my sweater collection, and I'm about to show you five of my favorite styles—and how I wear them. 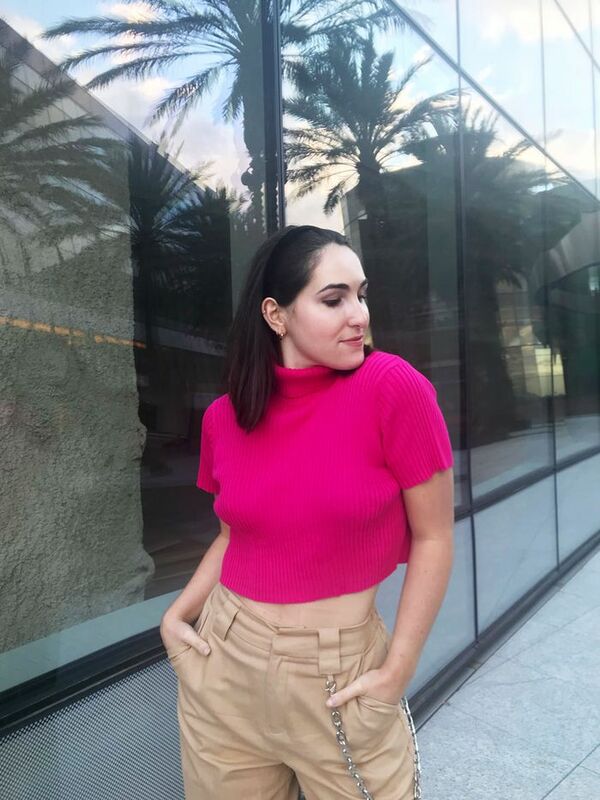 If you're as enthusiastic as I am about the style, keep reading to see how to wear cropped sweaters, shop the ones I recommend, and then browse the cropped styles I plan to invest in next. There's something a bit paradoxical about a turtleneck with short sleeves and a cropped hem, I'll admit. But as I noted earlier, a full-on turtleneck is often too much, and this bright knit is easily one of my favorite cropped sweaters I own, as it punches up any outfit I wear it in. The silhouette on this one is so good. It's hard to tell in the above photo, but it hugs in on the waistline and cuffs. That, combined with a deep V neck, makes it fit me so well. Plus, it comes in a ton of color options. Aritzia's selection of knits always comes in clutch. Unfortunately for the flurry of Instagram DMs I received about this cardi, it sold out within days of H&M's Studio Collection drop in the fall. But fortunately, a plethora of similar styles are on the market from every retailer getting in on the cardigan trend. This one says, "I'm not a regular sweatshirt; I'm a cool sweatshirt." It's technically a crop, yes, but with a longer hem than some of my other crops, so it plays well with mid-rise jeans, too. Though it frequents my gym bag, I attempted dressing it up for the office here with jeans, kitten heels, and a fun belt. I've shared my adoration for this sweatshirt before, along with the rest of Cotton Citizen's great selection of basics. So here are the CliffsNotes: It's got a weighty fabric that's actually quite breathable, and the crop hits at the perfect length, right above the hips. All the fashion girls are wearing this It sweater on Instagram… and I think I need it now too. Thanks to this chic outfit from Jen Wonders, this lovely Dion Lee crop made its way into my shopping cart. You can't see it here, but the model is also wearing a pair of Dr. Martens boots, making this an outfit I would 100% copy. You can never have enough cardigans when they're all this cool. Our editor Michelle owns in this one in black and I can't help but want the red version now too. Between the tie front detail and the sky blue color, I can't decide what I like best about this pick. I see a lot of layering in this sweater's future. Next, see the stylish sweater every celeb wears on repeat.